Jeannie Fulbright’s Exploring Creation Series has earned a reputation for presenting elementary science in an accessible, easily teachable way without dumbing it down. 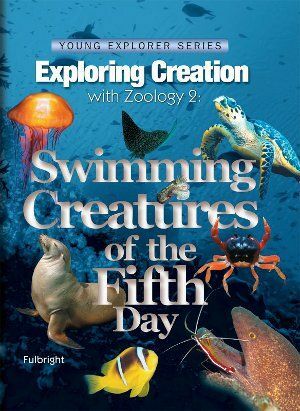 Mary (age 9), Peter (age 7), and I are all enjoying learning about God’s underwater miracles with Zoology 2: Swimming Creatures of the Fifth Day (Zoo 2) from Apologia Educational Ministries. 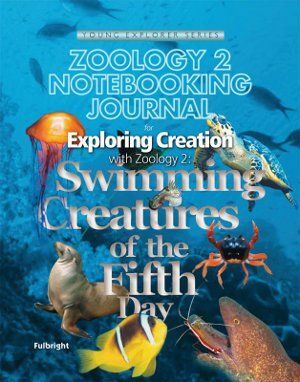 Apologia recommends the Zoo 2 text for grades K-6. The Junior Notebooking Journal is intended for K-3 (they have a Notebooking Journal for older kids). My recommendation: For the text, grades 2-4 with an adult teaching; grades 5-6 could easily use this as an independent study. Older children may enjoy reading it as a general overview. I agree with the age range for the Junior Notebooking Journal, though K-ers may only use the coloring pages---due to the ruled pages (see pics) it would be awkward for an adult to scribe for the child. Zoo 2 is a year-long curriculum divided into 13 lessons covering just about every creature you can think of that lives in the water, from sea anemones to cephalopods, to sharks, to leeches to…well, you get the picture. Each lesson contains several pages of reading interspersed with high quality full-color photos, diagrams, “try it” activities, and suggested experiments. The text encourages pursuing Charlotte Mason’s style of cementing learning through narration---there are no multiple choices questions or tests, but there are periodic discussion questions throughout each lesson. Each chapter ends with instructions to guide your child in creating their own notebook of what they are learning. Apologia has made it even easier to notebook by creating Notebooking Journals. Which received the Junior version, which is designed for kiddos who aren’t ready for a lot of writing. In addition to the notebooking pages you might expect find in it, it also contains coloring pages (2 in each lesson), copywork (both print and cursive versions of scripture), diagrams to label, and lapbooking elements. Peter is really enjoying the open-ended flexibility of the notebooking pages---I like the Phytoplankton with the chicken leg. Most of the Notebooking pages are in black and white, but there are also full-color pages to be cut out for mini-books. In addition to providing notebooking pages, the Notebooking Journal has a suggested schedule for completing the course (and an admonition to not try to do everything, there’s simply no way you can!). If you have a real hands-on or artistic kiddo, Zoo 2 also recommends creating an ocean box as an ongoing project. Your child can create creatures to add to it out of paper or clay, or even find pictures in magazines or online to cut out and paste. Peter is populating his box with creatures both real and imagined---you’ll notice he has a real angler fish (far right) and a “made up” one (just above it). When you purchase Zoo 2, Apologia also provides some great “book extras” (you’ll find a link and password in the beginning of the book) to add even more to your experience, including 70+ notebooking pages to print (they’re a little less sophisticated than the Notebooking Journal pages, but quite nice), plus links to multi-media resources and articles on the web---whale song, anyone? How are we using Zoo 2? I’m using this program with Peter (age 7, with special needs) and Mary (age 9). Peter is intellectually on target or beyond, but is highly distractible and has trouble with handwriting. I chose the Junior Notebooking Journal in the hope that the coloring pages would keep his attention and that the wider lines would be easier for him. Mary is at age level in terms of writing and advanced in reading. I had planned to download and print the free notebooking pages for her. The schedule provided by Apologia suggests doing each lesson over 2 weeks, 2 days a week. That schedule was unrealistic for us. It was too much in a day for Peter’s attention span and too much at once for Mary (who’s not a science lover). There’s so much information to digest! Lesson 2 covers all the different types of whales from dolphins to Blue whales….that’s a lot cover in 2 weeks. Zoo 2 also doesn’t shy away from introducing new vocabulary and using the real words that scientists use (scientific vocab is given in bold with phonetic pronunciation and the text explains its meaning). There is no glossing over or “talking down” to your kids (which I would hate), but it is written in a conversational tone. There are not any distracting sidebars and goofy graphics (which I would also hate). With all that going on, it made sense for us to spread it out over more days, when we tried to do too much, it felt like we were cramming. I decided to read a little each day, 3 days a week, and do the hands-on activities and any extra notebooking on Fridays. Before beginning each chapter, I also go through and add some little sticky-note flags to show me how far I’d like to get each day and make a note on them what notebooking pages apply to that particular section. I also dismantled the Notebooking Journal! The book has a large plastic coil binding. It’s also organized so that the lapbook mini-book pages are in the back of the book. You either need to rip them out (and risk damaging them) or cut them out of the book. And flip back and forth. It made sense to me to just take the whole thing apart and organize it so that I had all of each lesson together. I filed the lessons into a trusty file box and ta-da! No more flipping around in the book to find what I need! When we’ve completed the book, I can put it back together or bind it another way. I also found that I really didn’t need to use the downloaded notebooking pages for Mary---she liked the lapbooking bits (which have narrower writing lines) and Peter liked the notebooking bits, so between the 2 of them they were able to share the Journal, once I had in pieces (makes it easier for them to color at the same time, too). There’s actually a good bit of overlap in the areas that the mini-books and notebook pages cover (in lesson 1, both cover tides, and currents, for instance, including diagrams), but I know that I can still use the download notebook pages to fill in if I need to. We are also enjoying the “try it” activities and experiments. Did you know that you can demonstrate air pressure with a balloon and a water bottle? Pretty ingenious! The experiments and demonstrations use household items for the most part---ok, except the ocean currents one that calls for 2 hair dryers or fans (does anyone have 2 hair dryers?). I don’t have one reliable hair dryer. So we improvised with hot breath, lol. It actually worked pretty well (since I was one of the ones blowing, I didn’t get a pic of that). Yes, we are liking Zoo 2 very much. We especially like it that we are all learning so much. And that the learning sticks. One night, I asked Peter to tell his Daddy what he learned in science that day. And he jumped up from the dinner table and drew this diagram, explaining about the continental shelf, the abyssal plain, and more. I recommend Apologia’s Zoo 2 for grades 2-4 with an adult teaching, or I’m certain a 5th or 6th grader could do this study solo. It’s an engaging study and easy to implement---everything you need to know is in the textbook. The Junior Notebooking Journal is a nice addition, but not completely necessary. The free downloadable notebooking pages you receive access to with your book purchase will work quite nicely, but I do like having the variety of pages, including coloring pages, in the Journal. We love Apologia. We have the Botany and and Zoology 2 & 3. I don't think we will ever get rid of these. My son likes reading them just for fun. This week I found something really neat. I have created a vocabulary list with definitions at http://www.spellingcity.com/ They then use this list to play games like Match It Sentences or Match It Definitions. They love it, and it's reinforcing what they're learning. This is a truly wonderful review. I just LOVE the photos, but I really enjoyed seeing how you modified it and how you made it work for your family. This is just fantastic. Thanks so much!